The Lady Vikings improved to 10-3-0 with a 4 win week at the So Cal High School Classic in San Diego, CA. The road trip started the day after Christmas before the sun came up departing Dallas Love Field for Los Angeles at 6:00am. Upon arriving in California it was just a hop, skip and a jump down the PCH to San Diego. 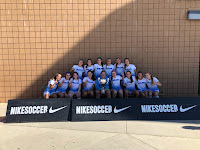 Four games in 5 days for the Lady Vikings ended with a dramatic com from behind double overtime, shootout victory over Mission Hills in the championship match. The Lady Vikings will be ringing in the New Years as champions of the So Cal High School Classic Presented by Nike. Winning their bracket with scores of 6-1 and 4-0, the semi-final and championship were a little different. Head Coach, Jay Fitzgerald mentioned, "We had a relentless competitive spirit, something we are obviously capable of but I haven't seen from this group but not consistently. We can win any game we play." The semi-final match up against Bonita Vista was a back and forth affair with the Lady Vikings scoring first with Abby Geiser feeding a ball across to Mikaela Gamboa hammering home the eventual game-winner. Team defending backed up by goalkeeper, Avery Boley kept the shutout and the berth into the championship match the following morning. The Lady Vikings took to the town for some sight-seeing and a nice dinner to keep their minds right for the championship. Fitzgerald continued, "It was a special evening for our team, the social media takeover, the bonding, and family atmosphere put us in a good place." A post-Christmas training session at Oceanside High School started the week for the Lady Vikings and a championship match at Oceanside High School ended the week for the Lady Vikings. Going down early in the match, the Lady Vikings fought right back with another combination between Geiser and Gamboa. Geiser was right where she needed to be to equalize. This was the first goal that Mission Hills has conceded all year. The relentless spirit that Fitzgerald mentioned earlier in the week proved to be evident once again. This team was not going to lose this match. When we didn't have the ball, we wanted to get it back and when we did have the ball we went at them. Our transition played a huge part in our success this week. We all played a part in defending and attacking whether on the field or off the field. Another end to end match and despite losing a couple players to injury, everyone stepped up and fought through different roles. 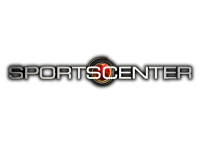 Neither team would surrender another goal through regulation and the match would head to overtime, golden goal overtime. Earlier in the year, the Lady Vikings gave up an early goal in overtime and that was not going to happen again. The first 10 minutes saw the Lady Vikings in the half of Mission Hills for the entire half other then one counter that caromed off the post. The second overtime was more like regulation, end to end but still no team was able to score. This match was going to be decided from the penalty spot. Confidence was all I saw from our five shooters, a couple that have never taken a penalty shot. Our goalkeeper has never been in a shootout and she made a save and forced one over the bar. Allee Kimmey put the Lady Vikings ahead and Abbey Button stepped up and scored the game winner on the last shot to win 4-2. Abby Geiser and Meghan Kittleson also scored on their attempts. "This was a huge step for our program, we got everything out of this trip that we wanted. We are closer as a group and what a way to end 2017 heading into the grind of the next 2 months," Fitzgerald remarked. The Lady Vikings will now prepare for hosting their own national event starting on Thursday, the National Elite Prep Showcase. The nations #6 team and 2017 UIL State Finalist, Keller is the lady Vikings first opponent at 1:00pm on Thursday with Buchholtz from Florida the next day, finishing with Odessa. The Lady Vikings made their 15th trip out of state this week, 13 times to California and 2 times to Florida but this year it is San Diego, CA for the first time ever to compete in the So Cal High School Classic. Christmas was short-lived for this Lady Vikings side as they got on the road around 3:30am the morning after to catch a 6:00am flight to Los Angeles. In just under a week, the Lady Vikings have compiled 3 out of 3 wins, 2 by way of a shutout and found themselves in the championship match on Saturday morning at 10:00am against Mission Hills High School. as they head home on Saturday night. In 1999, the Nolan Catholic Women's Program got on the national map by defeating the #1 team in the country and from that year on they put together arguably the strongest schedule in the country each year playing teams from all over the nation. The summer of 2000 the Lady Vikings were invited to the National High School Coaches Association Championships in Orlando, FL where they were crowned champions with a win over St. Pius X from Georgia. Since this national recognition, the Lady Vikings Soccer Program have been heading west during the Christmas Break since 2001 as traveling to Walnut Creek, CA. In 2001, Nolan Catholic played in a four team round robin showcase hosted by Carondelet Catholic were they also played Santa Margarita Catholic and San Ramon High School. The very next year they were invited to the Tri-Valley Showcase in Walnut Creek, CA and every year through 2009 they returned. Taking a break from 2010-2014 and they returned to the Tri-Valley again in 2015. With these new relationships and national respect, the Lady Vikings hosted their our own showcase. 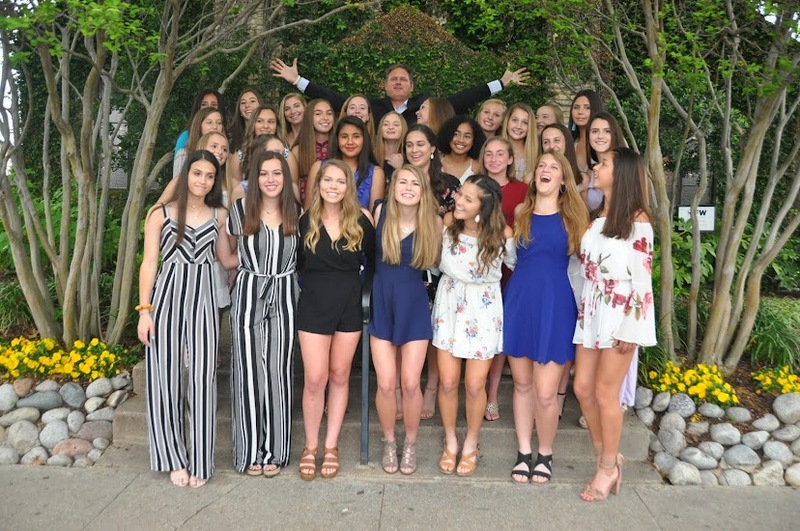 The Nolan Showcase was born in 2003 with 4 of the top teams in the country all from North Texas and in just the second year of the Nolan Showcase they doubled in size to 8 teams and had Carondelet Catholic and Santa Margarita Catholic attend. Now in the 16th year of the event, it is now a full fledged National event called the National Elite Prep Showcase. The National Elite Prep Showcase brings together the top high school girls soccer programs from around the country. It is a true college showcase for high school soccer. This is where the best come to play. The battle for #1 starts here. Olympians, National team, college and World Cup superstars, National and State champions have all competed in this event. "Last year because of conflicts with our final exams and the Tri-Valley Classic dates, we traveled to Santa Barbara to the San Marcos Holiday Classic. 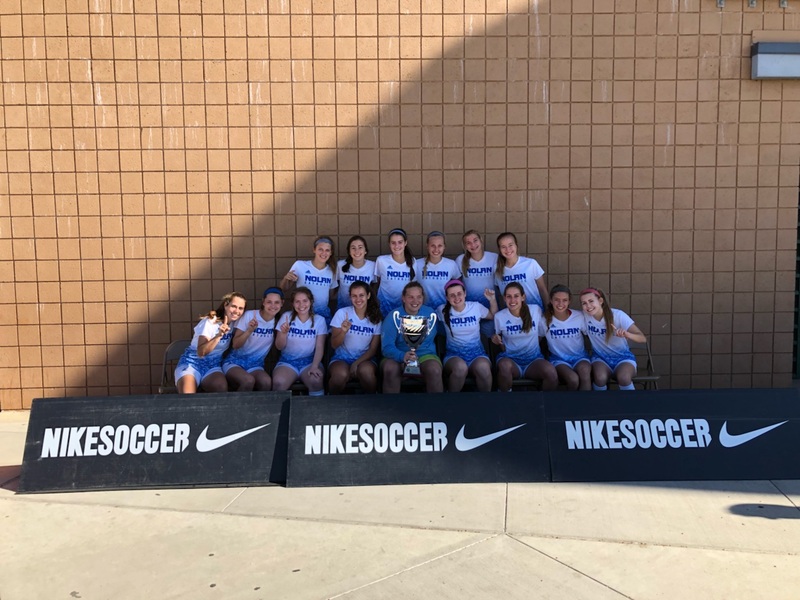 This year we ran into a similar issue with our finals being later and we accepted an invitation to the So Cal HS Showcase in Oceanside, CA," LVS head coach, Jay Fitzgerald mentioned. Our players are no strangers to traveling across the country to get in front of college coaches and our program is no different. We want college coaches to know that high school soccer can produce top level college players. This year the Lady Vikings will again play one of the most competitive national schedules with 4 CA teams and 1 FL team on our schedule along with the UIL State Finalist, other public school powerhouses, and then their own strong district schedule. The Lady Vikings have traveled to California 12 times and 2 times to Orlando. In those years combined with hosting the National Elite Prep Showcase, the Lady Vikings have played a total of 64 teams from out of state since 2000, more than any team in the country. The Nolan Catholic Women's Soccer Program takes advantage of tons of resources putting their players in the most challenging environment possible. The Lady Vikings kick off the So Cal High School Classic with a match against Sage Creek High School from Carlsbad, CA on Wednesday, Dec. 27th at 8:00am PT. 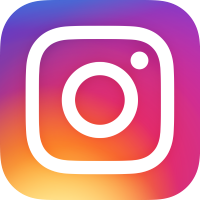 Follow Us on Twitter and Instagram @nolansoccer for LIVE updates. Also visit www.socalhsclassic.com for tournament information. The Nolan Catholic Women's Soccer Program is excited for the holidays but even more excited for the 13th Annual Nolan Soccer Alumni Day. 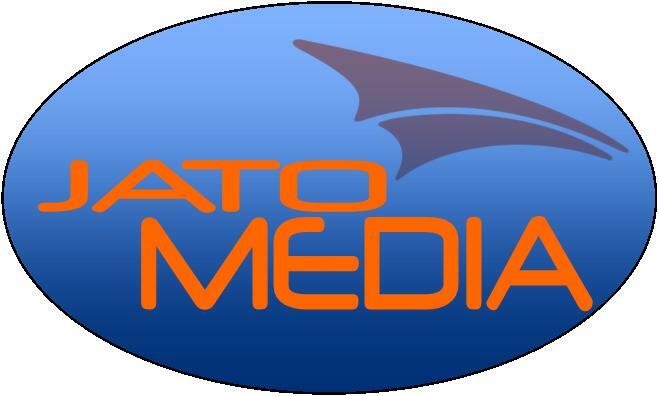 This event comes one year after last years successful New Year Eve Alumni Day. The Lady Vikings travel to San Diego, CA for the So Cal HS Classic the day after Christmas and return to take on their alumni hero’s. Come on out and show us that you haven't missed a beat. 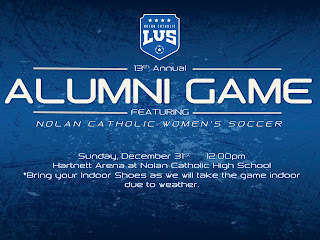 Whether you are currently playing or haven't played since your LVS days we would love to see everyone. 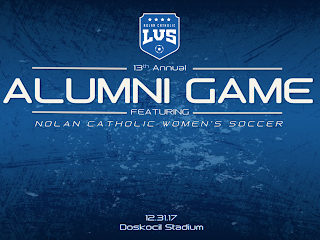 Be there...Sunday, December 31st at 12:00pm at the beautifully updated, Doskocil Stadium. See our brand new field, our brand new press box, and our brand new video board to watch your skills and spills on display. Free food and fun. 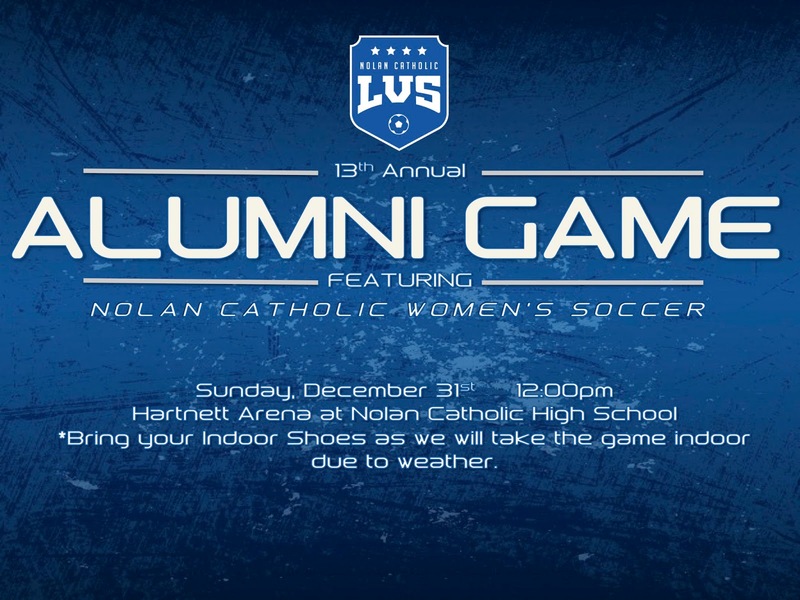 The LVS Alumni Soccer Day is in its 13th year so come out and work off that Christmas turkey and stuffing before ringing in the New Year. Our Lady Vikings have been hard at work gaining local and national respect. With an overall record of 5-3-0, the Lady Vikings will kick off the year with a friendly against the #6 team in the land, Keller High School on January 4th hosting the nations top soccer showcase, the National Elite Prep Showcase January 4-6. The Lady Vikings will also take on Florida powerhouse, Buchholtz High School from Gainesville, FL. The Lady Vikings Soccer program takes great pride in playing one of the most competitive schedules in the country; the mentality is fueled by the competitive spirit in the programs current and former players. There is a No Fear factor and LVSers are always up for a challenge. With a massive district win to start last week on the road at Prestonwood, the Lady Vikings suffer 2 losses the very next day at Hockaday with the JV surrendering a 4-1 defeat and the varsity upended 5-0. "Our energy was directed elsewhere, our over-confidence got the best of us, and we just got beat by a good team, " LVS head coach, Jay Fitzgerald mentioned. Fitzgerald referring to his varsity teams' inability to handle the success after the big win the day before. With a goal conceded early and late in the first half, the Lady Vikings couldn't take advantage of some solid opportunities created in the opening half. Fitzgerald continued, "When we watched the game as a team, we created some very good situations that we are use to creating but we were too far gone mentality before the game even started and couldn't recover." The JV had an opportunity to reflect as well and put their words to action on Friday night with their best performance of the season. Paola Vazquez led the way with 4 goals with Alex Alvarado, Victoria Clark, and Madison Ginani each added one of their own. With several players sidelined due to some minor injuries the Lady Vikings were able to learn from the early week loss and put together a solid shutout victory at home over Greenhill 7-0. Yesterday’s game was incredible. We totally played as a team, we had a rhythm and a pace that we haven’t seen before. We are in a place of skill and drive that is brand new. Last night was a big step up for us. It's was probably one of the best games I've ever seen us play. The timing, the runs and the team transition was perfect. It really gave us a lot of confidence individually and as a team. The Lady Vikings continue back to back matches this week with the varsity traveling to Liberty Christian on Monday and John Paul on Tuesday. The JV with just one game on the week on the road with the varsity on Tuesday at John Paul. The senior, freshman combination continues as Megan Bettinger and Abby Geiser accounted for 8 goals and 4 assists on the evening with 5 goals coming off the foot of Bettinger and 3 from Geiser. A total of 7 LVSers got on the score sheet last night with goalkeeper, Avery Boley earning her 3rd shutout of the season. Taking a 4-0 lead into halftime, the Lady Vikings continued to build on that lead throughout the second half of play improving to 4-2-0 on the season. Hockaday is the next stop for Nolan Catholic tonight at 5:00pm for the JV and Varsity teams. The Lady Vikings improve to 3-2-0 in district play with a 9-0 win over Parish Episcopal on Friday night. The usual suspects were on tap on the evening with seniors Megan Bettinger, Meghan Kittleson (3 assists), and Mikaela Gamboa accounting for 5 of the 9 goals. Bettinger and Gamboa each scored 2 goals. Bettinger commented about the team, "We got a shutout and our 3 points and have really worked on our structure and shape as a team going into Prestonwood. I am really proud of us going into next week and the rest of the season." Of the 6 goals, underclassmen had a part with freshman, Abby Geiser leading the way for the Lady Vikings with a hat trick on top of 2 assists. Sophomore, Rachel Firestone scored her first career high school goal on the evening as well. Maggie Tepera added a goal and assist. "We have to make up for 50 goals we lost year to graduation and the leadership from our seniors and juniors are making its way down to our younger players and with 26 goals in 5 games is a start. There are a lot of good things we have taken from our first 5 games and we are much farther ahead then we were at this time last year," commented LVS head coach, Jay Fitzgerald. The Lady Vikings continue district play next week on the road on Tuesday at Prestonwood. The very next day the JV and Varsity travel to Hockaday for a 5:00pm kick-off, both teams play at the same time. Then on Friday, there will be a JV doubleheader as the Lady Vikings host Greenhill at 5:30pm with the boys following at 7:00pm. The Lady Vikings Soccer varsity team will be taking on Parish under the light tonight in a TAPPS 1-6A match up. Kick-Off is scheduled for 6:00pm. If fans cannot make it out, no worries as the match will be broadcast LIVE through @NCHSmedia with coverage beginning at 5:50pm #lvsLIVE. CLICK HERE to Watch. The Lady Vikings are 2-2-0 in district play heading into tonight match. "There are a lot of good things that we have taken from our first 4 matches and from where we were last year at this point, we are farther ahead," said LVS Head Coach, Jay Fitzgerald.